"It happens only once a year, twice if we are lucky.... With a quick thaw, the water runs nearly as fast as the adrenaline..... When the conditions are just right, a winter waterslide runs right through the yard...... The sun shines down just enough to keep you from freezing as the water gently pushes you down. 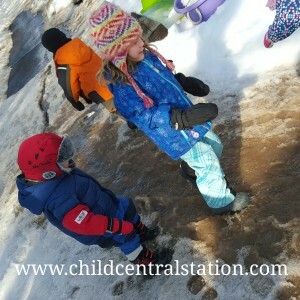 Child Central Station, March thaws, hilly yards, Pure Upper Michigan, Pure Play! " 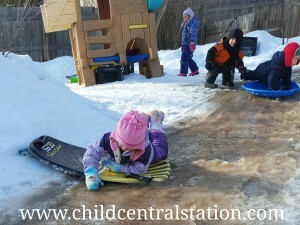 Our house is built into a hill, which provides us with many wonderful opportunities for play. With it comes a number of challenges as well. However, we do our best to turn things positively as much as possible. One of the things that tends to happen when the temperatures start to rise is that all of the melting snow/slush/water makes a river that runs right down our driveway and into the backyard. A couple of times of year we have a steady flow of water. When it happens early enough in the season, the water runs down right over our sledding hill. The water does not seep into the soil, but instead runs on top of a thin layer of ice and slush. 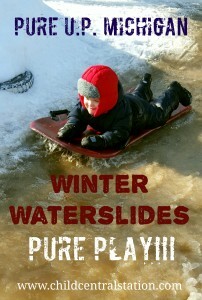 When this happens.... We have the perfect winter waterslide! I'm telling you, the pictures do not do this justice! It is hard to capture moving water! 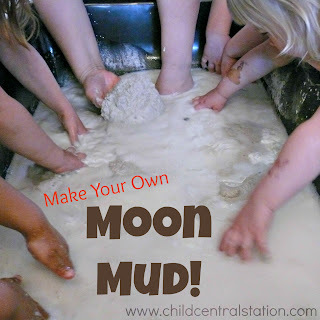 The children cannot get enough of this kind of play! 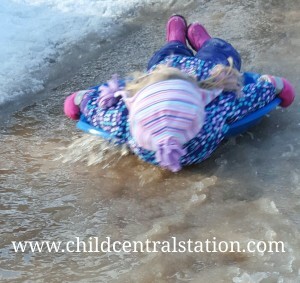 The splashing, the jumping... the gliding down the hill and the races back up to the top! I know that through my travels, some professionals really cringe when I talk about spending so much time outside in these types of conditions. I hear a lot of well, isn't it too cold? That looks way to wet... What a mess! And yes.... what a beautiful, cold, wet mess! The exploration and learning that happens during this type of PURE PLAY is far to valuable to keep the children from experiencing it. They need to experience with every ounce of their being, to have the freedom to jump, to run, to splash... and to be cold..... They need to feel the running water, to hear it, to try to control it... and they can't do any of that by watching a screen or peering outside a window. Did we get wet?- yes. Did their clothes dry?- eventually yes! Did we get dirty? - of course! Did we clean up! - of course! Was it a lot of work- YES!!!! Most Real Play is Messy! Get over it! Embrace it! Cherish it!